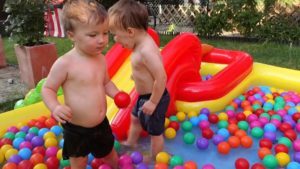 I have been frequently asked, with a typically cold and gloomy weather, what are the games played by kids? Are they only indoors or play outdoors as well. Well, British youths to participate in a wide of variety of sports with interests that change with age. There is ample opportunity to participate in both indoor and outdoor activities. Swimming, football, and cycling are some of the most popular sports with rank varying by age. The need for more physical activity among the youth is especially critical today as the fight against obesity rages on. The impact of the lack of exercise and a poor diet has led to a dramatic increase in the rate of childhood obesity. The need to get up and become active has never been greater. 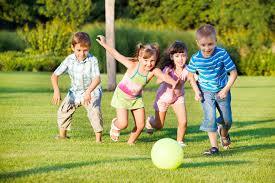 Recent studies indicate that most parents surveyed played outside seven days a week as a child. Today the youths are not as active even with great community involvement. 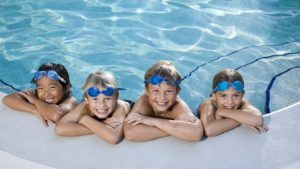 Despite the gray weather, the most popular activities for five to ten-year-olds in Britain is swimming and diving. For the older youths, football becomes the most Popular games sport. There are numerous local sports facilities and teams to encourage youth participation. Of course, there are many games and activities that do not require participation in a sport and can be played with a group or two people. A rough and tumble game is a Bulldog. The idea is to avoid the “bulldogs” in the center of the field. The player must run from one side of the field to the other without getting tackled. The winner is the individual who remains free. A somewhat kinder, gentler game when compared with Bulldog is Fishy Fishy. A request is made to cross the water. A specific group is then called, “Yes, you may if you have.” Those matching the description run in the hopes of not being caught. Losers are tagged, not tackled making it safer for the younger kids. Conquers involves the seed from a horse chestnut tree. The seed is knotted and the opponent determines the height to place the seed and is given three hits to destroy the conker. The individual who destroys the most conkers is the victor! It is a simple game with an interesting scoring. Another group game is “What time is it, Mr. Wolf”? The wolf responses with a number say 5. At that point, the group moves five spaces. When Mr. Wolf senses the group is close, he yells “Dinner Time” at that point the goal is to tag one of the kids so they will become the new Mr. Wolf. Queenie Who’s Got the Ball is another playground favorite. There are a number of ways to play, but the Queenie must find out who has the ball by asking a series of questions based upon a description such as hair color. If the person with the ball is the last one standing they become the Queenie. Many of the childhood Popular games played today in Britain are the decades-old standards played almost everywhere in the world. 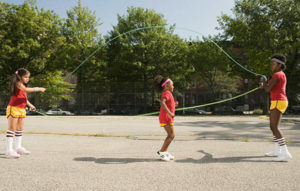 British children like skipping-or jump roping in the US-as well as Hopscotch Marbles and Jacks. Of course, the most popular game remains football.